Summers can be rough on lawns. There are pests, lots of water and few feedings. Due to recent lawn fertilizer rules many residents could not feed their lawns at a time when they seem to need it the most. But now it appears everyone can renew the green and toughen up their St. Augustine turf for fall. If there is any doubt about the lawn care laws in your area contact your local University of Florida Extension Office. Start with a good feeding. 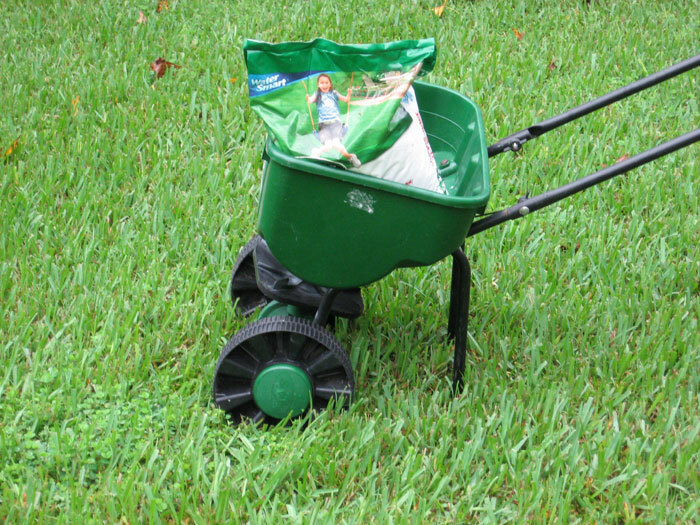 Select a quality lawn fertilizer that can feed the lawn over time. These are normally marketed as slow or time release products. Make a feeding now to provide the needed nutrients that can stimulate some growth to thicken the lawn and fill in the bare spots. Most lawns like to grow during the early fall months so this feeding is timely. Follow the label instructions on the product you choose. Do weed control once you match the weeds with a control product for your lawn type. Aeration could be performed with compacted, hard to wet or nematode infested lawns. Check soil acidity and adjust pH as needed. Keep mowing your turf at the highest level. Feeding time is over for zoysia, centipede and bahia lawns. Extra fertilizer this late in the season makes them susceptible to fall problems.